The high level of technical detail included in standards specifications can make it difficult to find the correlation between the standard specifications and the theoretical results. This book aims to cover both of these elements to give accessible information and support to readers. It explains the current and future trends on communication theory and shows how these developments are implemented in contemporary wireless communication standards. 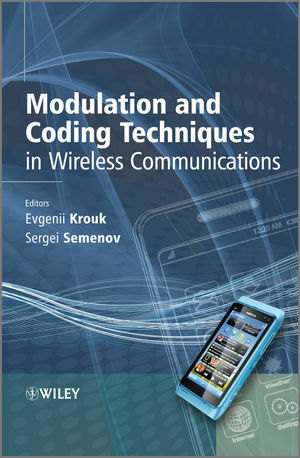 Examining modulation, coding and multiple access techniques, the book is divided into two major sections to cover these functions. The two-stage approach first treats the basics of modulation and coding theory before highlighting how these concepts are defined and implemented in modern wireless communication systems. Part 1 is devoted to the presentation of main L1 procedures and methods including modulation, coding, channel equalization and multiple access techniques. In Part 2, the uses of these procedures and methods in the wide range of wireless communication standards including WLAN, WiMax, WCDMA, HSPA, LTE and cdma2000 are considered. Professor E. Krouk has worked in the field of communication theory and techniques for more than 30 years. His areas of interests are coding theory, the mathematical theory of communications and cryptography. He is now the Dean of the Information Systems and Data Protection Faculty of the Saint-Petersburg State University of Aerospace Instrumentation. He is author of 3 books, more than 100 scientific articles and 30 international and Russian patents. Sergei Semenov received his Ph.D. degree from St.-Petersburg State University for Airspace Instrumentation (SUAI), Russia in 1993. Dr. Semenov joined Nokia Corporation in 1999 and is currently a Specialist in Modem Algorithm Design/Wireless Modem. His research interests include coding and communication theory and their application to communication systems. 1.1 Principles of Reliable Communication. 1.3 Fading Processes in Wireless Communication Channels. 1.5 WSSUS Models for Frequency-Selective Fading. 2.1 Basic Principles of Bandpass Modulation. 3. Block Codes (Grigorii Kabatiansky, Evgenii Krouk, Andrei Ovchinnikov, and Sergei Semenov). 3.5 Bounds on Minimum Distance. 3.11 Decoding of BCH Codes. 3.12 Sudan Algorithm and Its Extensions. 4. Convolutional Codes and Turbo-Codes (Sergei Semenov and Andrey Trofimov). 4.1 Convolutional Codes Representation and Encoding. 4.4 Upper Bound on Bit Error Probability for Viterbi Decoding. 4.6 Parallel-Concatenated Convolutional Codes and Soft Input Soft Output Decoding. 4.A Modified Chernoff Bound and Some Applications (Andrey Trofimov). 5.2 Equalization Based on Sequence Estimation. 7. Coded Modulation (Andrey Trofimov). 7.1 Principle of Coded Modulation. 7.2 Modulation Mapping by Signal Set Partitioning. 7.4 Performance Estimation of TCM System. 8. MIMO (Andrei Ovchinnikov and Sergei Semenov). 9. Multiple Access Methods (Dimitry Osipov, Jarkko Paavola, and Jussi Poikonen). 9.1 Frequency Division Multiple Access. 9.2 Time Division Multiple Access. 9.3 Code Division Multiple Access. 9.5 Random Access Multiple Access Methods. 10. Standardization in IEEE 802,11, 802.16 (Tuomas Laine, Zexian Li, Andrei Malkov, and Prabodh Varshney). 10.3 IEEE 802.11 Working Group. 10.4 IEEE 802.16 Working Group. 11. Standardization in 3GPP (Asbjørn Grøvlen, Kari Hooli, Matti Jokimies, Kari Pajukoski, Sergei Semenov, and Esa Tiirola). 11.1 Standardization Process and Organization. 12. CDMA 2000 and Its Evolution (Andrei Ovchinnikov). 12.1 Development of 3G CDM 2000 Standard. 12.2 Reverse Channel of Physical Layer in CDMA 2000 Standard. 12.3 Forward Channel of Physical Layer in CDMA 2000 Standard. 12.4 Architecture Model of CDMA 2000 1xEV-DO Standard. 12.5 Access Terminal of the CDMA 2000 1xEV-DO Standard. 12.6 Access Network of the CDMA 2000 1xEV-DO Standard.